Ding Productions is a leading producer of live entertainment and while we have been busy doing just that, we have also been working on a plan to provide relevant training by industry leaders for professional artists and artists in training. We are excited to announce that our next Industry Session for 2018 is MUSIC THEATRE with IAN STENLAKE, STEPHEN MAHY and SARAH MORRISON! THIS INDUSTRY SESSION HAS BEEN TAILOR MADE FOR STUDENTS AND PROFESSIONALS WHO WANT TO FURTHER DEVELOP THEIR POTENTIAL AS A TRIPLE THREAT! Zoe Komazec will be joining the workshop to assist with choreography and is one of the fabulous ensemble members of MAMMA MIA! Family, friends and interested artists can now also attend the Question and Answer session being led by Ding’s Artistic Director, Jo Casson. Tickets to attend this one hour session are just $10 per person. Throughout this day long workshop participants will develop acting skills for stage, choreography and movement, vocal harmony techniques and story-telling through song. Each of our three stars from MAMMA MIA! THE MUSICAL will lead interactive workshop sessions across the day as well as participate in an insightful panel discussion about the music theatre industry. Participants will also have the chance to workshop a music theatre scene combining all three elements being studied across the course of the day. It is a great opportunity for singers, dancers and actors who would like to keep refining their craft and further develop their skills across all three disciplines. 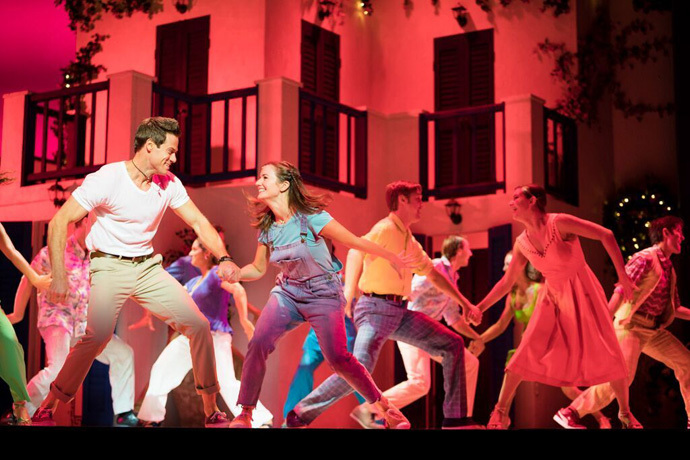 This music theatre industry session will be led by Ian Stenlake, Stephen Mahy and Sarah Morrison who are all currently starring in the National tour of MAMMA MIA! The MUSICAL. Ian Stenlake is a sought after performer in Australian film, television and theatre. He has won two green room awards for Best Male Artist and his credits include “Georgy Girl”, “Oklahoma!”, “Sea Patrol” and “Stingers”. Stephen Mahy is a WAAPA graduate and one of Australia’s favourite leading men. His principal role credits include “Jersey Boys”, “Grease”, “The Rocky Horror Picture Show” and “Miss Saigon”. Sarah Morrison has recently broken through as one of Australia’s leading female musical theatre and television artists. She landed her first leading role as ‘Lisa’ in the sell-out season of “Ladies in Black” before being cast as ‘Sophie’ in “Mamma Mia! The Musical”. This is a unique opportunity to learn from Australia’s leading musical theatre artists and continue to develop your skills as a triple threat performer! If you wish to hear about other workshops and master classes, register below to join The Industry Sessions 2018 mailing list via MailChimp.